If you scan through all four Vedas, Mahabharata, Ramayana or any other Hindu sacred text, you will not find a single mention of the word, Hindu. Yes, it’s a strange fact but real one. And when I inquired the same with my teacher and friend, Arun Kant, who loves to debate about Hinduism and Vedas, approved my discovery. I find it pretty odd, I mean, when you talk about Vedas, Bhagwad Gita, and Ramayana as your sacred texts, and your sacred texts don’t even mention about your religion at all. Isn’t it funny? Moreover, when I asked Kant Sir, What does that mean? Why is there not a single mention of “Hindu” and “Hindutva”? He replied, because Hindu is not a religion, it is a geographical term that has lost its meaning with time. In actuality, we don’t have any religion. But that doesn’t mean we are infidels, what we follow, known as Dharma and more specifically, Sanathan Dharma. For instance, he reminded me of my Nani (Read, Dharma is not same as the Religion), and he continues, If you go by basic definition of religion, you will know, religion is a specific set of rules and obligations generally agreed upon by the people. It has a prophet or founder, and a holy book. For say, Jesus and Bible in Christianity, Buddha and Dhammapada in Buddhism, Mohammad and Quran in Islam, Guru Nanak Dev and Guru Granth Sahib in Sikhism, and every other belief with a founder and a so called holy book. But there is no such thing in Dharma, it has no founder, and sacred text, even what we think as sacred is not sacred. So what are they?, I questioned. He replied, Vedas are the books of science, socioeconomic, and philosophy, whereas Ramayana and Mahabharata are mere epic stories, discussing different aspects of life. But they are not rule books or some kind of divine path. However, what inspired me to write the post, when someone shared “Save the Hindu” slogan and coincidentally someone shares, Lisa Miller’s article on Newsweek, U.S. Views on God and Life Are Turning Hindu. It is pretty interesting to note, I mean, in a country, where if you ask one to fill bank’s personal information form, four out of five will tick Hindu in religion section. And still some of these are sloganeering “Save the Hindu”. Isn’t it a lame joke? But before jumping to any conclusion, we need to find, what does Hindu really means? And how Dharma became the Hindu? And do we really need to save the Hindu? The word Hindu has it origination from old Persian name of the Indus River, Hindush. The Persian word helped Arabs to come up with the term, al-Hind, referring to the land of people who live across Indus river. * The term Hindu which was used demographically by Persian and Arabic rulers became religious with invasion of India by Muslim ravagers and slowly it replaced, Dharma and became our new religion. Now, if you are going to argue, Hindu is same as thing as Dharma. The answer lies, what do you really mean by Hindu and Dharma. Hindu is a stout, someone who believes in customs, rules, caste and creed, someone who is afraid of god, where as, Dharma is about someone who believes in equality, beauty and love. In addition, consider himself and others as a part of one supreme being. So one can say, Dharma is not same as Hindu. However, the big question pops up, what motivate Hindu identity in ourselves. Frankly, it’s because of lack of knowledge fueled with socio-political factors. These factors were first used by Muslim rulers, then by British Rulers, and now by our very own politicians. Now, Who is Hindu and do we need to save the Hindu?” I leave the answer to these question to your understanding. 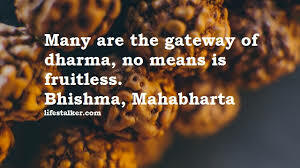 But meanwhile, I also leave you with a quote on Dharma by Bhishma from Shanti Parva, Mahabharata, Chapter 59. Only that is dharma what scriptures say, so hold some, but others don’t agree. We do not blame either, but say that all is not contained there. 1. You can read Vedas (Rigveda, Samveda, Yajurveda, and Atharva-veda), Ramayana (Valmiki Ramayana) and Mahabharat here online at Internet Sacred Text Archive, Hinduism section. 2. I deliberatly used the word “Hindu” instead of “Hinduism” where it could be possible. * Refer to Wikipedia Hindu Page. ** You can read the above quote from Mahabharta online in English and Sanskrit at Sacred Texts Archive.